Get the complete Poster Collection series! On the occasion of the release of the 30th edition of our Poster Collection we are offering the complete series* at a special price of € 480. It features all publications from Revue 1926 published in 2001 to Self-Promotion released in 2018. All Poster Collections were published in collaboration with the Museum für Gestaltung Zürich and feature posters from the museum’s archive. 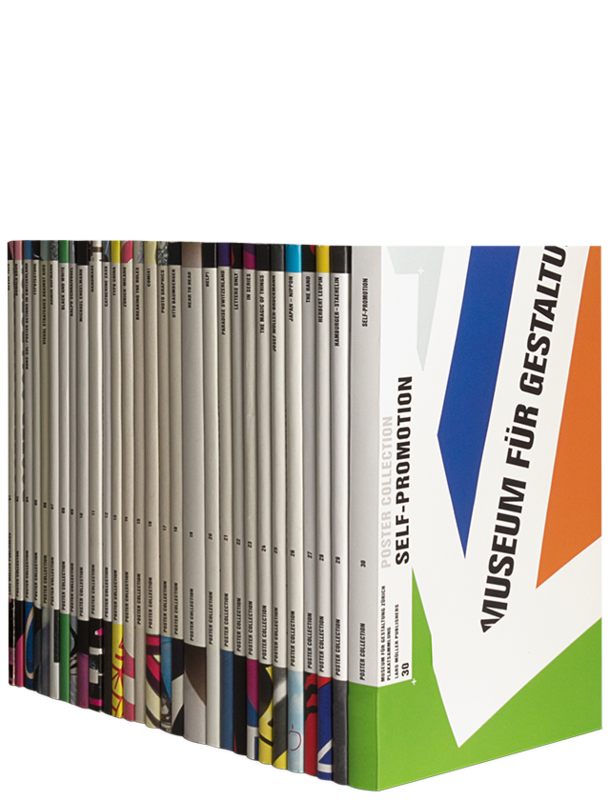 The publications are thematic; one examines visual strategies against AIDS, another one features posters with photographs and some pay tribute to renowned graphic designers such as Armin Hofmann, Josef Müller-Brockmann or Herbert Leupin. *Poster Collection 3, Posters for Exhibitions 1980–2000, and Poster Collection 5, Typotecture, are out of print and therefore not part of this offer. All other editions are included. The offer is available for the duration of the exhibition Plakatgeschichten at the Museum für Gestaltung Zürich (March 3rd to December 31st) of the posters featured in Poster Collection 30, Self-Promotion.